From left are Swayde Finch, Shane Souders, Steve Wilhelm, Kaylan Turnmire and Jared Weller. During the first night of WLC students were asked to define and discuss citizenship. During this students would be in groups and discuss the main idea of citizenship while later students would be split into community groups and discuss what an engaged citizen looks like. In the first full day of the conference, titled “Me,” the objectives include identifying personal passions and strengths. After being in the big group discussion students split into community groups and created personal purpose statements. During the night of the first day students took a night tour in Washington. Students saw the Vietnam Memorial, WWII Memorial, WWI Memorial, Abraham Lincoln Memorial, MLK Memorial, FDR Memorial and the Iwo Jima Memorial. At the Iwo Jima Memorial students were told of the lives of each soldier who pulled the flag up. On the second day, called “Me Day,” students traveled to Arlington and saw JFK’s grave and saw the Changing of the Guard. After going to Arlington, students formed groups, defined diversity and race, and identified aspects that make us diverse. During community groups students created and shared their philosophies about diversity. Then during the third day, “We Day,” students went to the Capitol and took a group photo. Then the students returned to the hotel and analyzed needs of their communities back home and developed a wide-ranging and high-impact community service initiative that could be implemented with the help of their FFA chapter at home. During the fourth day,”Do Day,” students saw the Newseum. After this, students learned that the world needs them more than they think. Students learned that poverty and malnutrition is bad in the world and learned the percentages of people who don’t have enough to eat. Then during dinner students were put into four sections of the dinner room. Two sections with tablecloths represented people who could afford food and other accessories. The other two sections represented people who are homeless or too poor to buy food. For the last day of the conference students boxed up 59,700 bags of fortified macaroni, with each bag capable of feeding two people as an initiative with Meals of Hope. After that students traveled to the Ronald Reagan Center and were given free time to explore Washington, D.C. During this time students had the chance to see the Holocaust Museum, Tower, and the White House. After this students returned to the hotel to talk and make commitments to helping their community and the world. Then to end WLC students celebrated with dancing. 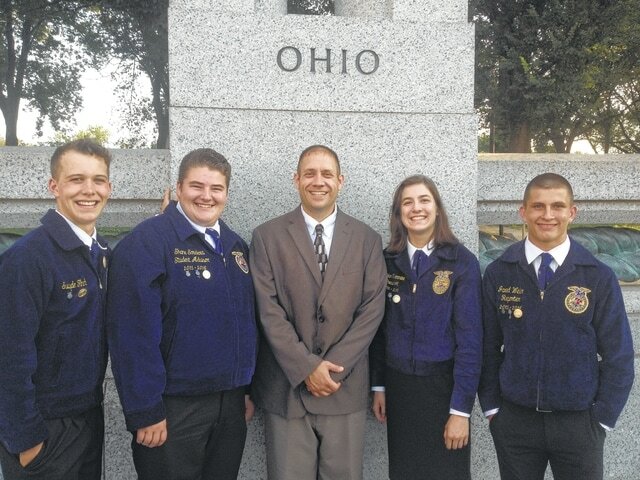 “Students who attend the Washington Leadership Conference learn their purpose, how to value people, how to take action and the importance of serving others,” said National FFA Organization CEO Dr. Dwight Armstrong. “They leave with the knowledge and the confidence to act in ways that help their schools, communities and their country.” Agricultural Education teachers attend the Washington Leadership Conference as well, learning how to motivate and help develop their students’ personal growth and leadership potential and how they can help maximize their local FFA chapters’ community-service initiatives throughout the year. The conclusion of each weekly session of the Washington Leadership Conference is a civic engagement activity in which participants apply what they have learned at the conference to a real, hands-on service activity. https://www.urbanacitizen.com/wp-content/uploads/sites/36/2015/08/web1_photo.jpgFrom left are Swayde Finch, Shane Souders, Steve Wilhelm, Kaylan Turnmire and Jared Weller.